Born in Washington DC and Quaker educated, the artist Sharon Cosgrove is a Professor of Art based in Wilkes-Barre, Pennsylvania where she maintains a private studio and teaches undergraduate courses in studio art. She holds a BFA, MA, and MFA from the University of New Mexico and a BA from Shepherd College. 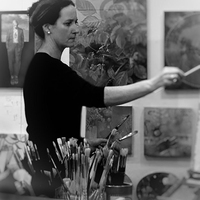 Her paintings and prints have been exhibited in invitational, solo, and juried shows, nationally and internationally and can be found in both public and private collections, including the Philadelphia Museum of Art. Serving in an “ambassadorial” role for cross-cultural exchange, Sharon’s work has been selected for the Art in Embassies Program sponsored by the U.S. Department of State and was displayed at the U.S. Embassy in Astana, Kazakhstan. As part of this program, she also traveled to Kazakhstan to offer presentations and master classes in conjunction with women’s history month. Sharon is the recipient of the Medici Award in Painting from the International Biennale Exhibition of Contemporary Art, in Florence, Italy, and has been Visiting Artist at the Brandywine Workshop in Philadelphia, The International School of Art in Umbria Italy, The American Academy in Rome, and the Burren College of Art in Ireland. By student nomination, Sharon received the Non-Traditional and Innovative Teaching Award at Wilkes University where she has served as professor of art for nearly three decades. Additionally, the Pennsylvania Council on the Arts, community scholarships, faculty development grants and sabbaticals have helped support her studio practice and commitment to teaching. Sharon has taught in Florence, Italy and facilitated group painting and mural projects with international artists, students, and victims of domestic violence. Her work has been the catalyst for personal, professional, and community transformations.